You’ve planned your flowers, disco and party poppers but think that might not be enough. These little ideas will keep your wedding personal, beautiful and stunning. The usual sprinkles you have on the tables of the guests say things like congratulations or are shaped like little bottles of champagne. It is possible to have these cut into whatever wording or shape you like. You could go with either your full names or just your initials. These wooden letters tend to be in most country homes spelling out things such as ‘love’ or kids’ names. There are companies that trade specifically in these letters and in various sizes too. Get your names or letter that spell out ‘I Do.’ Leave little letters lying around to point your guests in the right direction or use them to sign places of interest such as the guestbook. Candles can create beautiful, soft light. Don’t go for the traditional cream candles try something a bit more exciting. Try finding pillar candles in various colours and patterns. If there is a body of water such as a pond or fountain at your venue then pop some floating candles in for a bit of ambience once it gets dark. 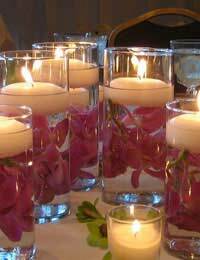 Floating candles are also great in bowls of water to be used as centrepieces. Tea lights are great for lining pathways to lead guests to where the reception is being held. Instead of going with the usual confetti try something a bit different, get guests to shower you and your partner in rose petals or glitter. You can get confetti in much more than the usual bits of coloured paper you also have the option of crystals, silk rose petals, artificial snow and feathers. You could lay a piece of red carpet as a runner in the place where the reception is being held. This makes a great accessory especially when photos of your guests are being taken on it. You can litter the aisle and floors of your venue in small pieces of glitter and confetti. Not something a guest would necessarily feel underfoot but would notice when they looked down. During your first dance you might wish to put on a bit of a show for your guests. Talk to the lighting technician, they might be able to time their lighting with your song. They can also advise on indoor fireworks and having personalised lighting to be projected on the dance floor including your initials. Fairy lights also give an ambient, fantasy touch to your venue. Stick with white unless you have a specific colour theme, drape these around entranceways, paths, signs and so on. Try something different, go for sunflowers if you are having a summer wedding or get your florist to decorate your flowers with coloured wire, glitter and ribbons. A bouquet of spring flowers at a spring wedding will add in beautiful colour and fragrance. Or you can take advantage of foliage such as grasses. Bring in some beautiful pot plants full of greenery and overflowing leaves.